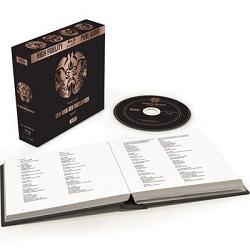  4788370 : 14 CDs containing the operas plus the 2-CD audio guide An Introduction to Der Ring des Nibelungen and CD-Rom with libretti and translations for around £35, as against the Amazon UK price for the blu-ray edition of £42.42 ($60.08 from Amazon US). For anyone who owns a blu-ray player – if not, why not, when good players can be obtained for less than £100 – I don’t think there is any contest. My wife will certainly be pleased to see the amount of space saved when the CD sets go off to the charity shop, for all the pleasure that they have provided. In 2012 Paul Godfrey reviewed a de-luxe presentation containing the blu-ray now issued on its own, a DVD, 17 CDs and a reprint of John Culshaw’s book Ring Resounding. Though I cast covetous eyes on the review copy, it always struck me as overkill and I was not surprised to see that when that limited edition was exhausted the present blu-ray audio plus hardback with libretti and translations took its place at a more reasonable price. When Universal released it earlier this year I promised it to myself as a birthday present and it duly arrived on the very day. We always include purchase buttons inviting readers to order recordings from Amazon UK and Amazon US. On this occasion I put my own money where my reviewer’s mouth is and ordered from Amazon UK, not out of any sense of loyalty but at the most attractive price that I could find. Having ordered on Sunday afternoon, I thought I had left it too late but I took possession of it less than 24 hours later. My acquaintance with Solti’s Wagner goes back even earlier than the recordings on this blu-ray. In 1957 Decca recorded Act I of Die Walküre with Hans Knappertsbusch directing the Vienna Philharmonic, planning to record the remaining acts with Kirsten Flagstad, then towards the end of her career but still in good voice, as Brünnhilde. The conductor chosen for that recording of the Todesverkündingung (all that Flagstad agreed to sing of Act II) and the whole of Act III was Georg Solti. The 2-LP reissue of that recording on Decca’s mid-price label was one of my last LPs to go, only to be replaced by the CD of Act III. More recently Acts I and III have been united on Australian Decca Eloquence 4801892 (2 CDs – review). The following year Flagstad was still in good voice for a swan-song as Fricka in Rheingold, the first complete opera from the Solti cycle which I was able to afford when the SXL LPs, without libretto, were remaindered to make way for the SET replacement, Decca very considerately including the SET booklet with the remainders. That Rheingold recording set new standards in realistic opera recording: as John Culshaw reveals in Ring Resounding, even the anvils in Nibelheim were very carefully chosen to play in tune. That recording was reissued on Decca Originals in 2008 and I welcomed its return in such an inexpensive format and in impressive 24-bit re-mastering. (4780382: Bargain of the Month – review). Back where I had started with the version which I had borrowed from the university record library and purchased when I could afford it, I was very pleased to re-greet an old friend. My only surprise was that Decca had not emulated RCA in reissuing such a fine recording in SACD. Now they have gone one better with the blu-ray audio option. What is true of Rheingold is also true of the other Ring operas: instead of Solti’s Walküre I went for Karajan on LP, later for the Fritz Reiner recording, originally released by RCA but subsequently reissued on three CDs by Decca, who made the recording. Though no longer available, it’s worth seeking out, but a very late encounter with the Solti recording as a download converted me to the one opera in the cycle which had never quite clicked for me – DL Roundup June 2010. Even when I made the Mark Elder recording of Walküre on the Hallé label Recording of the Month – review – my enthusiasm for the Solti remained undimmed. It’s sometimes said that the success of this Ring cycle is less attributable to Solti than to the team of performers and to John Culshaw as producer. While there is some truth in that, I remember hearing a broadcast performance of Act II of Siegfried with Solti directing a much later team, some time in the early 1980s, and thinking that he had not lost his touch. I no longer have the cassette recording that I made or the means to play it, but listening again to the same act on the new release reminds me why the 1962 recording of what many regard as the least successful opera in the cycle is almost my favourite… until I listen to Götterdämmerung again. The Solti Ring has never sounded better in audio terms. Listen to the Entry of the Gods into Valhalla (track 28 of Rheingold onwards) and any other recording pales in comparison. The Barenboim recording comes close, but even that is less impressive. (The Ring complete in wav and mp3 on USB for £50 or less, 2564641265 – review) 2. Recently I have been watching and listening to Sebastian Weigle’s 2012 Frankfurt Ring on DVD (Oehms OC999, 8 DVDs). Rheingold is available separately on OC9953 (the earlier 2010 recording is on OC935, 2 CDs – review) and I have enjoyed watching it more than any other video performance that I’ve seen, even including Böhm; by no means to be dismissed even if you listen rather than watch, it’s much less impressive in audio than the refurbished Solti on CD or blu-ray. Terje Stensvold as Wotan summoning the gods to proceed to Valhalla at the conclusion sounds decidedly ungodlike alongside George London (Solti). Dietrich Volle’s Donner, too, hardly sounds like the Lord of the storm that he professes to be (Ihr Dünste zu mir! / Donner, der Herr / ruft euch zu Heer). Donner’s hammer blow and thunder crash are a mere ping and a pop, as all other recordings that I’ve heard also are, by comparison with the Decca. The earlier (2010) performance on CD actually sounds preferable, though there the hammer lands with a thud rather than a loud clang. Nevertheless, though I’ve been criminally slow in setting down my thoughts on this series, let me say that this is a set to which I shall return for the visual experience – but as an adjunct to Solti. Walküre is on OC996, Siegfried on OC997 and Götterdämmerung on OC998. Decca singled out the forging scene from Siegfried and the final 20 minutes of Götterdämmerung for separate release on LP and here again other recordings seem pale by comparison, especially the absurd Stuttgart Ring on DVD which I reviewed some time ago, where Nothung4 is forged on the cooker in the kitchen of Mime’s bijou apartment, with Mime banging away with a spoon on a plate. If Solti is my all-time winner, the Stuttgart DVDs must be my undoubted Wagnerian turkey, with singing little better than the ridiculous direction. The only thing that preserved my sanity was the fact that I reviewed the set alongside the Chandos USB release of Reginald Goodall’s English-language performances. These two scenes plus the inevitable Ride of the Valkyries and the Magic Fire Music were subsequently showcased on cassette on 4171814 and remain available with additions on a budget-price 2-CD set of excerpts (Double Decca 4483392). These represent good points to try the blu-ray release: subscribers can stream the whole Solti Ring, with 218-page booklet, from Qobuz and others can sample. Don’t be tempted to purchase the download at £67.07 for 16-bit and £90.28 for 24-bit but be prepared for the quality of even the streamed version to convince you of the desirability of Decca’s refurbished sound. I wouldn’t recommend even hard-up Wagner lovers to economise by buying the 2-CD excerpts either: they will only tempt you to spend less than four times the price of that set on the blu-ray release. As with Donner’s hammer blow in Rheingold, I compared Barenboim’s recording of the forging of the sword with the Solti. Some very fine singing apart, it’s a tame affair, with the sound of the sword being forged unimpressive compared to John Culshaw’s achievement. Rather unfairly I compared the new transfer with my 4-CD set of Siegfried, specifically with CD2, the end of Act I and opening of Act II. I say unfair because I have Decca’s first CD transfer from 1984 on 4141102. The greater convenience of blu-ray is immediately apparent in that the break between CD1 and CD2 comes at an awkward point, between Siegfried’s words as he returns and Mime’s reply. In aural terms that first transfer was revelatory but the improvement made by the new version is apparent – the orchestral opening sounds very little different but immediately Alberich begins to sing, greater vocal firmness is evident, resolving the one issue which made some prefer the greater vocal forwardness on the Karajan recordings. When the first CDs were released in 1983 reviewers spoke of the effect of a veil being lifted. As between the 1984 CDs and the new blu-ray yet another veil has been lifted. With the Decca Originals Rheingold the effect is much more subtle, since that had already been given the 24-bit treatment and a modest degree of CEDAR de-hissing. I imagine that the same will be true of the CD set of the whole Ring about to be released but I would still recommend spending the small extra amount on the blu-ray if only for the sheer convenience of not splitting the music between discs. Only the provision of the notes, texts and Decca’s much-improved latest (1996) translation in the handsomely-bound booklet adds to the bulk of the new release. Ditch the attractive but unnecessary slip-case and it’s no bulkier than one 4-CD set. As usual with blu-ray audio, the selection of operas and tracks can be done from your television screen but the quality of sound is appreciated only through an audio system. Choice of opera can be made from the remote pad: red button for Rheingold, green for Walküre, yellow for Siegfried and blue for Götterdämmerung. Oddly enough those directions are not given anywhere in the packaging, though they should be intuitive, given the order of buttons from left to right on most remotes. Quirkily, my Cambridge Audio 650BD, one of the best blu-ray/SACD players, reverses the yellow and blue buttons, so I wondered at first why I got Siegfried instead of Götterdämmerung and vice-versa. The 650 and its successor the 651 have been discontinued in favour of the 752BD – expensive, but recently reduced to £599 – and the buttons on the 752 remote appear to be in the normal order. I could wax lyrical for ages about this new presentation of the Solti Ring but it all boils down to something even simpler than the headlines with which I began: this is as notable a bargain as ever there was and it gives these superb recordings a new lease of life which I doubt will ever be bettered. 1 I haven’t heard the Esoteric pressings from Japan but they are expensive and heavy. 3 Limited separate availability currently in UK. 4 I’m not sure why Wagner felt the need to change the name of the sword – Gram (wrath)in the Norse legends – to Nothung (Need or Necessity).